Sharing lets users grant other users (internal or external) access to files that they own. If allowed, users can also share files that they have received share invitations for. Figure 12-1 presents a high-level overview of the sharing functionality available in Filr. The sections that follow provide more detail. Depending on the sharing privileges they are granted, internal users can share and collaborate with each other, with external users who have been invited to self-provision into the Filr system, and with the public. If re-sharing items is allowed, those who receive share invitations can also share. 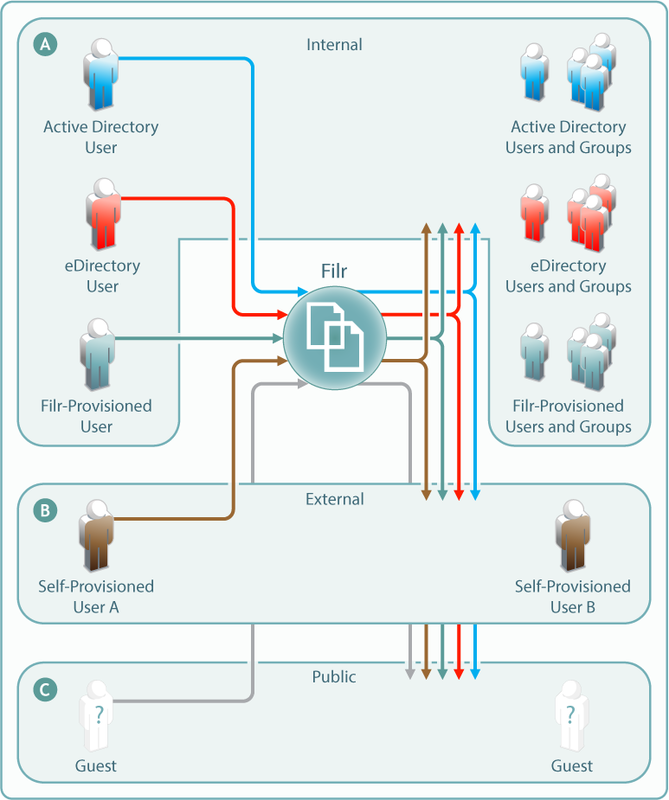 This means that eDirectory users can share files with Active Directory users and groups, that the reverse is also true, and that both of them can invite external partners or others to join the Filr system for collaboration and other purposes. When External Sharing is enabled in Filr, external users who receive share invitations can self-provision into the Filr system and collaborate with internal and external users, using the Comments feature. If Filr is configured to allow it, external users can also share with internal users, with each other, and with the public. If Filr is configured to allow public sharing, and if a file is shared publicly through a system-generated URL, then anyone with that URL can access the file as a guest user and share it with any other user, including other public users. This re-sharing is not a function of Filr but a function of sharing the URL through email, social networking, and so on.